The law of texting while driving (“TWD”) has changed in Virginia. § 46.2-341.20:5. Prohibition on texting and use of handheld mobile telephone; penalties now makes TWD a “primary offense,” which means that an officer can pull you over for texting even if you haven’t done anything else wrong. Moreover, “lawfully stopped” does not include being temporarily stopped by a red light or heavy traffic, so there’s no exception for when, for example, you’re sitting at a red light (subsection D, “texting”). On the other hand, some of the exceptions still apply. 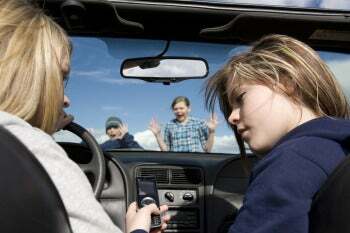 You may use your phone to operate your GPS system or embedded music player while driving. You may receive and end telephone calls as long it doesn’t take more than a single gesture (i.e., swipe or button push) to do so (subsection D, “Texting”). You may use your phone in *any* manner as a response to an emergency (subsection C). You may use your device “hands free” as long as it’s mounted (i.e., you aren’t holding it with either one or both hands) in such a way that you don’t have to unbuckle your seat belt or adjust your proper driver’s sitting position to access it (subsection D, “Use of a handheld mobile telephone”). This exception does not apply to texting! You may not text even if the phone is mounted! Note: These bullet points are summaries of the exceptions. Please read the statute to make sure you understand them completely.